Spectacular Private Mountain Home-5 minute, easy walk to Silver Lake ski lifts! Welcome to our mountain retreat at Deer Valley. 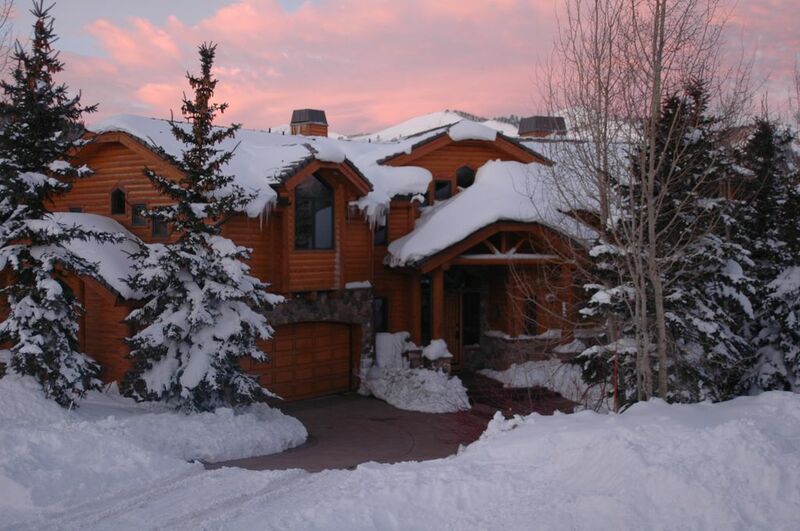 Enjoy yourself in this exclusive private home in the heart of Deer Valley at Silver Lake. This home has the feel of a spacious mountain chalet and features 6 bedrooms, each with its own private bath (two of the bedrooms are magnificent master suites), spectacular mountain views, a wonderful Great Room with vaulted ceiling and gourmet kitchen, large family room on a separate level with HD TV/DVD, 6 fireplaces, steam showers, sauna, hot tub, private study, broadband internet with Wi-Fi, heated drive and walkways, private garage parking and so much more - over 7,000 sq ft of living space on 3 levels. The structure of the home makes it perfect for two or even three families to share, or for business, church or community groups looking for a place for an offsite retreat. For family groups, the adults typically gather in the main floor Great Room and kids hangout together in the downstairs Family Room with the big flat screen TV, game table and video game connections. There are numerous private sitting areas throughout the house which makes it easy to find separate space to relax, read or have a private conversation. Both the main sitting area around the fireplace in the Great Room and the large Dining Room table are excellent for group gatherings. This luxurious home offers a spectacular location mid mountain, with every amenity. For skiing, you can walk one block to the lifts at Silver Lake and leave your skis and poles at the complimentary overnight ski check there. For guests who would prefer to drive to the lifts, we also provide a complimentary parking pass for heated indoor parking at The Chateaux Deer Valley, across the street from the Silver Lake lifts. Deer Valley and Park City offer so many winter (and summer!) vacation opportunities: fantastic skiing at Deer Valley and Park City (Park City and The Canyons have now combined to form the largest ski resort in North America); cross country skiing, snow shoeing, snowmobiling - virtually any outdoor winter sport you can think of can be found here at its best. Park City also offers many attractions to appeal to your whole family or group. Historic Main Street was the center of the community when it was a mining town. It is lined with restaurants of all types - gourmet to funky bars - as well as galleries and other shops. The community also has a number of high end spas which offer massage and facial treatments. For those who want a great gym for working out, Silver Mountain Athletic Club in the middle of town is a fantastic facility with dozens of weight machines, a huge setup of free weights and an entire separate level of cardio equipment - plus a big open area for stretching and floor exercises. There is a heated outdoor 25 yard pool that is open year round. No wonder so many Olympic athletes train in Park City! World class accommodations on top of the world with the best snow on earth. Make this high end private mountain home your vacation home. We offer online reservations and you can also email or call Dennis, the owner, for reservations, rates and any questions you may have..
Beautiful views of Deer Valley ski runs from upper level. With good snow conditions, it is possible to ski out to the lower mountain at the Deer Valley Resort from the driveway next door to our home. Requires intermediate skier skills. Skiing at the Deer Valley Resort one block away. Snow Boarding at Park City Mountain Resort, 10 minutes away. This home and it’s owners leave no stone unturned in creating a perfect vacation in Deer Valley. Exquisite furnishings, attention to every detail and incredible location, created the perfect spot for our four couple get away. I can’t imagine a more upscale spot! We shared this house with 2 families and it worked perfectly. There is plenty of room for everyone. Two masters and a third queen bedroom. Kids loved the bunk rooms! The house has everything you need. Local house management was super helpful if you needed anything. It comes with a parking pass for the garage right across from Silverlake lifts which we loved so I recommend having at least one car. You can walk from the house but this was better for kids. Overall, this is a beautiful house that was very convenient and we had a great time staying there! This home is spectacular. The team was outstanding with preparing the house prior to our visit. During our stay, we had no problems that required their attention. We will definitely plan to use this home again when we visit Park City. Great home with tons of space. Beautifully furnished and meticulously maintained. Owner and Matt, the property manager, were very friendly, helpful and responsive. Our extended family of 7 adults and 10 children enjoyed an absolutely fantastic stay in your beautiful, spacious, clean, comfortable, lovely mountain home. It exceeded our expectations. Lots of light, views from every room, and close proximity to the lifts made it the perfect retreat for our family. Everyone loved it! This home was centrally located in Deer Valley and near Park City with amazing views, every amenity you could want, and more than ample space for our extended family. Every couple had their own rooms and we could hav brought even more people. It was clean and well maintained. I highly recommend this property! Thank you! Ski Access: it is a level, one-block walk to the Deer Valley mid-mountain lifts at Silver Lake. Alternatively, there is a ski easement from the driveway next door that can be used in good snow conditions to ski out to the lower mountain at Deer Valley, but it is not possible to ski back that way. Almost all guests walk back and forth to the lifts, leaving their skis and poles checked at the complimentary overnight ski check at the Silver Lake Lodge.